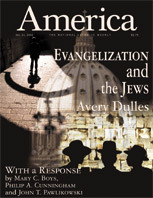 Since we hope that our statement will foster widespread consideration in the churches of Christians’ relationship with Jews and Judaism, we are grateful to America’s editors for inviting us to respond to Cardinal Avery Dulles, S.J., and thereby extending the circle of conversation. Reflections on Covenant and Mission, issued by representatives of the Bishops’ Committee on Ecumenical and Interreligious Affairs and the National Council of Synagogues on Aug. 12, 2002, has elicited both charges of apocalyptic apostasy and yawns of apathy. Neither extreme understands the document. Reflections illustrates theological developments since the Second Vatican Council promulgated its “Declaration on the Relationship of the Church to Non-Christian Religions” (Nostra Aetate) in 1965. Although the general contours of that statement are well known—the council refuted the longstanding charge of deicide and “deplored” anti-Semitism—its revolutionary implications are less recognized. For nearly 2,000 years, Christians predicated their identity on the notion that God’s covenant with the Jews had ended because they rejected Christ, and that the covenant now “belonged” to Christians. The council’s declaration repudiated this by teaching that Jews remain part of the covenant, thus initiating one of the council’s most profound changes in the ordinary magisterium of the church. The promulgation of this conciliar document inaugurated thinking unimaginable in earlier church teaching. Most Catholics have yet to internalize the implications of Pope John Paul II’s insistence in 1979 that the relationship between Judaism and Christianity is so close that they are “related at the very level of their respective religious identities.” In that same 1979 address, the pope said that because of this unique interrelationship, “we recognize with utmost clarity that the path along which we [Catholics] should proceed with the Jewish religious community is one of fraternal dialogue and fruitful collaboration.” In other words, dialogue, not conversion, should be the Catholic goal in relations with Jews. The Catholic portion of the Reflections thus seeks to explain an already existing reality. Unlike some Christian groups, the Roman Catholic Church does not engage in campaigns to baptize Jews. Reflections accounts for Catholic disinterest in targeting Jews by tracing the development of official Catholic teaching since Vatican II; it cites encyclicals and speeches of Pope John Paul II and instructions of the Pontifical Commission for Religious Relations with the Jews. It is a mistake to dismiss this recent documentary tradition as merely irenic. As Cardinal Edward Idris Cassidy, who at the time was president of the Pontifical Council for Promoting Christian Unity, stated in an address to the International Catholic-Jewish Liaison Committee in 1990, these developments are part of the process of teshuvah, of reforming Christian theologies that promoted hostility toward Jews for hundreds of years. The developing tradition is motivated by fidelity to “the truth of the Gospel message [and] the spirit of Christ” (Nostra Aetate), whether Jews respond favorably or not. At the same time, the theological developments that have increasingly made their way into magisterial teachings about Judaism are not always evident in other recent official church documents. That inconsistencies and tensions appear is not surprising. So much church teaching is rooted in a deficient and negative assessment of Judaism that it will take many years to rethink Christian identity. Thus, we must be cautious in citing documents, since current ecclesial thinking is not entirely of one mind. Cardinal Dulles criticizes the presentation of evangelization in the Reflections as “difficult to reconcile with the teaching of recent popes.” He objects to the document’s “extremely broad definition” of evangelization and disagrees with its claim that equating evangelization with proclamation is “a very narrow construal.” Further, he disputes the statement’s assertion that interreligious dialogue must be devoid of “any intention whatsoever to invite the dialogue partner to baptism.” Citing papal texts, Cardinal Dulles counters that evangelization must be a “clear and unequivocal proclamation of the person of Jesus Christ” (Ecclesia in America, No. 66). Catholic teaching considers interreligious dialogue in the context of evangelization. By dialoguing with Jews, Catholics are evangelizing by witnessing to their faith in Jesus Christ. They do so, however, without the desire to convert them. Dialogue is distinct from seeking conversion to Christ, as Cardinal Francis Arinze, president of the Pontifical Council for Interreligious Dialogue, has repeatedly stated. “Dialogue does not aim at conversion in the sense of a change of religious allegiance, but conversion understood as greater readiness to do God’s will should be one of the aims and fruits of sincere interreligious dialogue” (The Church in Dialogue, pp. 331-2). To refrain from targeting Jews for conversion is not a rejection of the church’s evangelical mission but a recognition that this dimension of evangelization is inappropriate in the unique case of Judaism, the tradition to which we are “intrinsically” related, as the pope has expressed it. Much of Cardinal Dulles’s critique of these concepts in Reflections flows from his reading of the New Testament. It is not enough, however, to cite Scripture without recognizing that the Bible is the church’s book and that, therefore, the church continuously interprets those texts. In the words of the Pontifical Biblical Commission, “...[I]nterpretation of Scripture involves a work of sifting and setting aside; it stands in continuity with earlier exegetical traditions, many elements of which it preserves and makes its own; but in other matters it will go its own way, seeking to make further progress” (The Interpretation of the Bible in the Church, 1993). Thus, we are troubled by Cardinal Dulles’s assertion that the Letter to the Hebrews offers “the most formal statement of the status of the Sinai Covenant under Christianity.” Without further analysis, he quotes Hebrews: The “first covenant is ‘obsolete’ and ‘ready to vanish away’ (Heb. 8:13).” Christ “‘abolishes the first [covenant] in order to establish the second’ (Heb. 10:9).” Cardinal Dulles implies that Catholics believe that God’s covenant with the people of Israel is obsolete. The magisterium can explicitly contradict an idea of an individual New Testament author because the Catholic tradition is one of commentary, not of sola scriptura (Scripture alone). The author of Hebrews, convinced that he was living in the final stages of human history, could argue that the Old Covenant had yielded to the New. Two millennia later, however, in a church whose pope has prayed for God’s forgiveness for the sins of Christians against Jews, such an assertion is unacceptable. The constant disparagement of postbiblical Judaism through the ages and general ignorance of its character encouraged European Christians to marginalize and even at times demonize Jews, thus providing a fertile seedbed for the Shoah. Similarly, Paul’s words in Romans 11 cannot be actualized today without considering his conviction that Christ would quickly return to judge the living and the dead. Paul considered Jews who did not recognize Christ to be branches temporarily broken off to make room for the Gentile branches (Rom. 11:17-24). He believed these broken branches were irrevocably (11:29) destined to be regrafted because “all Israel will be saved” (11:25-26). Until that eschatological day dawned, however, Jews who did not accept Jesus’ Lordship were dead branches, detached from God’s unfolding plans. Paul could have imagined this temporary state of affairs in his eschatological enthusiasm. But another understanding of Judaism has developed in our time. The Vatican’s 1985 Notes speaks of “the permanence of Israel” as “accompanied by a continuous spiritual fecundity” over the ages. Thus, “the faith and religious life of the Jewish people as they are professed and practiced still today, can greatly help us to understand better certain aspects of the life of the Church.” Moreover, the rabbinic interpretation of Scripture, according to a 2001 Pontifical Biblical Commission study, is “analogous” and “parallel” to Christian readings (“The Jewish People and Their Sacred Scriptures in the Christian Bible”). So interpreting Romans 11 today entails respecting the ongoing spiritual life of Judaism. Far from being dead branches, Jews still draw nourishment from the good olive tree. Recent Catholic teaching also reflects the understanding that Jews have a mission to the nations that Christianity does not annul. Reflections cites various pertinent magisterial comments, including one from Cardinal Joseph Ratzinger, president of the Congregation for the Doctrine of the Faith: “God’s providence... has obviously given Israel a particular mission in this ‘time of the Gentiles.’” Reflections concludes, therefore, that the church no longer wishes “to absorb the Jewish faith into Christianity” and thus end Judaism’s distinctive, God-given mission in the world. Jewish expectation of a messianic age is “not in vain. It can become for us Christians a powerful stimulant to keep alive the eschatological dimension of our faith” (Pontifical Biblical Commission, 2001). By virtue of our covenanting, both communities will be in the eschatological kingdom; both are obligated to prepare the world for it. Until that Day, we do so in distinctive ways. The authors of “A reply to Cardinal Avery Dulles…” (10/21) state that the teaching of Hebrews and Romans on the covenants (Sinai and Calvary) is “unacceptable” and that “official Catholic teaching” has set aside this New Testament “opinion.” But they give no proof for their assertions. That a few Catholic (and other) teachers of Scripture or theology think this way, Yes; that “official Catholic teaching” holds this view, No way. Covenant understood as God’s everlasting choice of and love for believing Israel as His instrument for saving all the nations is indeed unrevoked and irrevocable. Covenant understood as the historical institutions – namely, the developed Mosaic Law and the Temple worship laid down for the fulfillment of that covenant in one stage of its unfolding – is ended. St. Paul taught that and the current Pope, as far as I know, has never suggested otherwise. Thus it is not God’s objective will today that believing Jews pursue salvation by observance of the developed Torah or the Temple worship, the latter being impossible for centuries. It is God’s objective will that they be saved by grace through faith in Jesus, God’s Anointed Son and Savior. In fact, however, because of the “veil” (II Cor. 3:14-18) that clouds Jewish believers’ reading of Scripture, they may indeed in all personal sincerity believe that observing the Torah is God’s signified will for their salvation and thus be linked by this authentic faith in the revealing God to the one Savior and to His Church. In their efforts to refute Cardinal Avery Dulles and reject the clear, unequivocal teaching of the New Testament, the authors apparently do not wish to benefit from this crucial distinction. They have “another Gospel” (Gal. 1:6, II Cor. 11: 3-4). Different Christologies beat at the heart of the different views of evangelization expounded by Cardinal Avery Dulles, S.J., and by Mary Boys, S.N.J.M., Philip Cunningham and John Pawlikowski, O.S.M. (10/21). Cardinal Dulles’s Christology flows from interpretations of Jesus in the Bible. Strengths: (1) the focus is on belief in God, with Jesus the human touchstone, and (2) the Bible is a relatively stable referent through time. Weakness: when focusing on belief in Jesus as God and on literal interpretations of the Bible, people may divorce Jesus from what he stood for (e.g., Evangelical Christian Zionists). Boys, Cunningham and Pawlikowski’s Christology is “Spirit-centered,” flowing from interpretations of Jesus’ Spirit for modern times. Strength: the emphasis is on what Jesus stood for—loving neighbor as self—and on interpretations of what this means in our time. Weakness: a tendency to divorce the spirit of love from its ultimate referent—Jesus—implies the possibility of self-deception. I believe circumstances can best dictate one’s evangelizing strategy. For example, I don’t think Cardinal Dulles would get very far expounding Jesus as the Son of God in the Knesset. On the other hand, Boys, Cunningham and Pawlikowski might touch the hearts of some Israeli legislators with appeals for showing the same basic fairness for Palestinians that they expect for themselves (such fairness being a type of love). Your back-to-back articles presenting contrasting views on “Evangelization and the Jews” (10/21) prompts me to write in thanks for what I perceive to be a style increasingly used in your publication. For a person like myself with no formal education in theology, but still very much concerned with the issues, reading Cardinal Avery Dulles and then the reply was tremendously helpful in my effort to listen critically to teachings on salvation outside of Christianity. I suspect this is a subject that many of us ponder as we reflect on the infinite love of God for all of his people—not so much on the question of salvation for all, but on the “salvation plan or covenant” that God may have for the many people outside Christianity. Please continue this very educational and stimulating style of journalism. My reading of Boys, Cunningham and Pawlikowski, “Theology’s Sacred Obligation” (10/21) is that after much explanation of differences between themselves and Cardinal Dulles’s “Covenant and Mission” (10/21) in the meaning of words, concepts and biblical notions, they still do not address the indisputable idea that the greatest gift ever given is a gift to be shared with all, Jesus the Christ. Where in the tradition does it suggest that 21st-century circumstances make it appropriate to exclude the Jews from the opportunity to hear this great news? Once people finish doing their best with words and reverencing others’ faith traditions (we grant this to the four authors), there remains the joy and the responsibility toward all to have Jesus be known more intimately, loved more ardently, followed more closely. This article also appeared in print, under the headline "Theology's Sacred Obligation," in the October 21, 2002 issue.